This far into the season, it’s time to dig deep — not just for the players, but for me as well, as this week’s W.A.T.C.H. List plumbs the depths of the rankings all the way down to #720 in the rankings. 2) If you made the final four at the Qatar F4? Well then congrats, ’cause you’ve got a career high ranking! One of those Qatar Final Fourers is none other than former University of Virginia standout Michael Shabaz, who’s been bedeviled by illness and injury since making a professional splash as a finalist of the 2010 Charlottesville Challenger (as well as a popular participant of the 2010 USTA Australian Open Wildcard Playoffs). The two-time NCAA champ (and 2005 Wimbledon Boys doubles titlist) was only able to play fourteen pro matches in 2011 and twenty-six matches in 2012 before finding this current run of health and form at the end of 2013, in what amounts to his first full professional season. The only downside to all this good news is that he’ll have to update his website sometime soon. What an amazing day of tennis at the Racquet Club of the South today! I was not able to see the ladies play, but I was able to go around the club and see all four of the men’s matches. Rhyne Williams really brought his A game but to be honest I really wasn’t expecting anything less from him. He is fresh off his win from the Intercollegiate Championships in N.Y. and honestly when I saw him in person, I was a little taken aback. He’s very tall and very quick on his feet. He is going places for sure and is someone to keep your eye on. Williams beat the second seed Tim Smyczek 6-4, 6-0. Wow! The match that I saw the least of was Denis Kudla and Jordan Cox, but I sat and watched them play table tennis in the players lounge after their match. Such unpretentious guys and very eager to answer any questions that I put to them. Cox is now living in Florida at Bollettieri’s Academy and Kudla is training in Boca right now, but still calls his home Northern Virginia and loves it here. Kudla will next play Jack Sock in the semifinals. Speaking of Sock, Jack was on fire today. He was up 4-0 in the first set and then hurt his hip somehow and I could tell it caused him some discomfort. Young came back after that, and the match ended up going three sets. Young lost the match with a double fault and then smashed his racquet into the ground not once, not twice, but three times to really make certain it was broken. What was so inspiring to me during that match was Sock’s passion. The fist pumping, the C’mon’s! I absolutely loved it and it was so much fun to watch. What a cute, cute kid he is, and boy does he really have some talent. America should be so proud to call him our own. 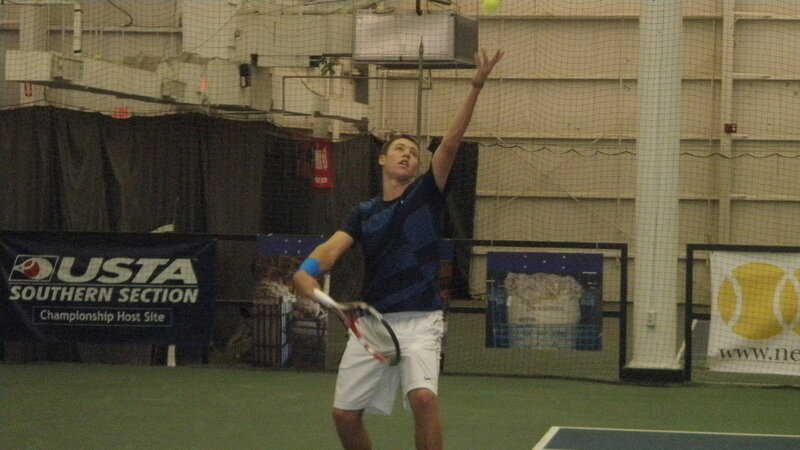 The final of the four matches was the Ryan Harrison and Michael Shabaz battle. Those two went head to head and Harrison had match point in the second set, but Shabaz refused to surrender and killed the ball to take it to a tiebreak. It was such a fun match to watch. Harrison is as passionate as Sock but probably has a little more arrogance about him than Jack. It was good though… all good. Harrison is very sure of himself and that confidence is going to take him far, no doubt. So, the semi’s start tomorrow at 1 p.m. EST on Sat. I am so excited to see these matches so stay tuned for more fun and awesomeness to come! Donald Young vs.  Jack Sock: This is the first meeting between the two. It’s an interesting match between the highly touted 18 year-old Sock, who is the current #32 junior in the world rankings and won the US Open Jr. Boys title this past summer (defeating fellow WC participant Denis Kudla 3-6 6-2 6-2 in the final), and Young, the now 21 year-old former world #1 junior (in 2005). Young has long been seen as one who hasn’t yet maximized his promise or potential, reaching a career high of #73 in the ATP rankings two years ago and currently sitting at #127. Of course, it’s too early to tell what the professional future holds for Jack, as he just turned 18 a few months ago and has only made a few forays into the men’s tennis game. Right now he sits at #872 in the rankings, but hasn’t played enough matches to where his ranking is nearly commensurate with his talent. Of course, just the opposite could be and has been said about Young. Lots of pressure on the hometown ATL top seed today. I’m keen to see how he meets this playoff challenge. Tim Smyczek vs.  Rhyne Williams – Also the first meeting for the two. It could be argued that the 19 year-old Williams has the most name recognition to the casual fan coming into this matchup, though Smyczek is almost 600 spots higher in the rankings. 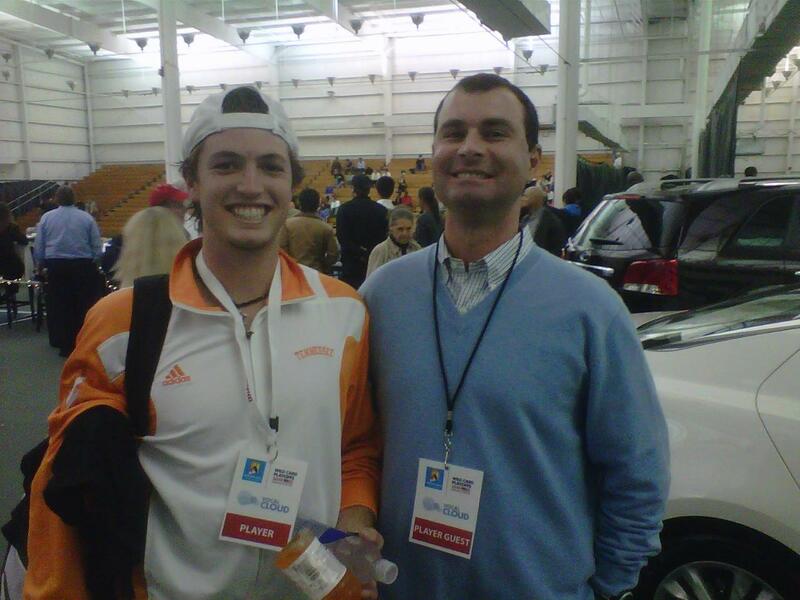 The University of Tennessee sophomore comes into the tourney on a bit of a hot streak, having won the USTA/ITA National Indoor Intercollegiate Championship in Flushing, N.Y, while 22 year-old Smyczek kind of muddled through the end of his Challenger season, going 4-5 to end his season and 39/30 on the year. I’d expect that Smyczek’s experience will pull him through this one, but it might be close. Ryan Harrison vs.  Michael Shabaz – This is the glamour match. The 18 year-old #173-ranked Harrison, of course, is the most highly praised young gun in the American arsenal at the moment, having upset Ivan Ljubicic at the US Open and almost doing the same to Sergiy Stakhovsky. 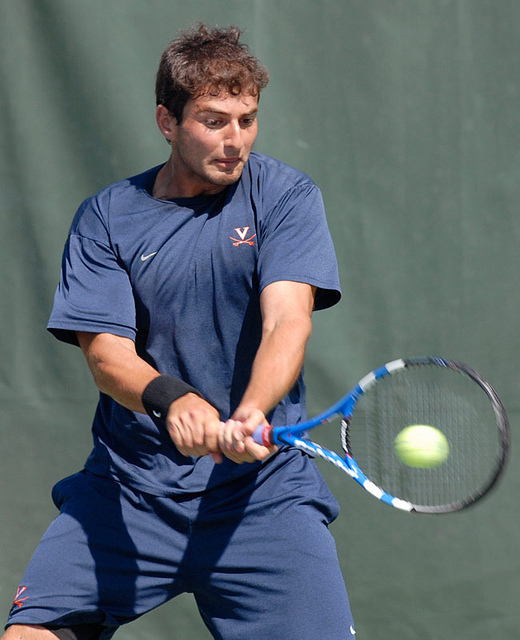 But UVA’s Shabaz won their only previous matchup 6-4 3-6 6-2 last month in the 2nd Round of the Charlottesville Challenger, and the 23 year-old went on to win the tournament, beating Kei Nishikori, Chris Guccione, Giovanni Lapentti and Robert Kendrick along the way (though not in that order). Ryan will be itching for revenge, but will Shabaz be able to get the better of him for the second time in two months? Let’s watch and see. 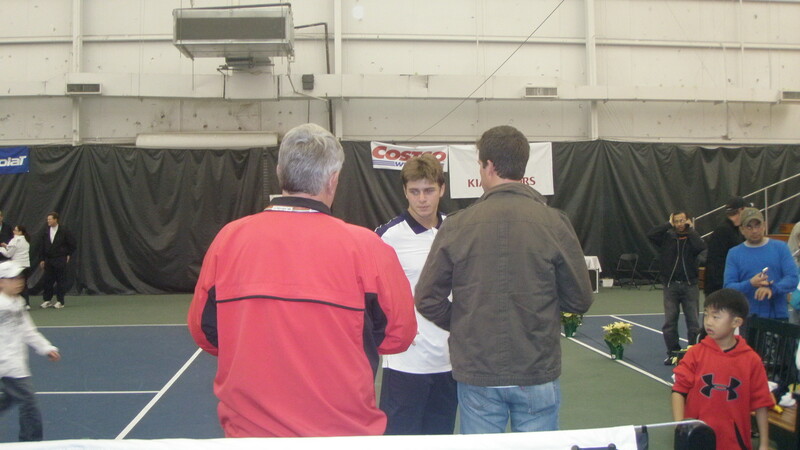 Jordan Cox vs.  Denis Kudla – Once again, a first meeting for both. It’s actually quite shocking the two 18 year-olds haven’t met on any level while consistently being among the best young American talents. Kudla is the current #1 U.S. Junior (#21 overall), despite losing that close USO final to Jack Sock. Jordan Cox, meanwhile, reached a combined junior ranking high of #36 in July of 2009. Both have had pretty decent years, making their first ventures into the pros: Kudla went 27/18 on the season and won the USA F26 Futures in October, while Cox went 29/25 and made the semis of USA F26 and the finals of USA F27. Not much between these two, as the seedings indicate. Should be a close one.